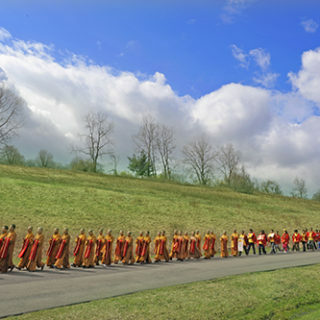 To promote virtuous Mahayana Buddhism, realize the great philosophy of “Peace, Health, and Harmony”, and facilitate those with a profound root of wisdom to reach the “Pure Land”, the compassionate Holy Master Ziguang Shang Shi has developed a holy site for imparting the profound Nine Vehicle Great Perfection Dharma, which is an amazing limitless path. The location is geared towards training up an ample amount of Buddhist Preaching elites, able to attain profound wisdom and courage in order for them to achieve enlightenment. • All applicants are required to attend an interview and pass an entrance exam. The level of programs ranges from primary, secondary, advanced, and mastery level. Duration of programs may vary from three (3) to nine (9) years depending on the specification of a particular level. Every student is subject to take and achieve a passing score from a series of tests and exams prior to pursuing any program advancement. All admitted students are responsible for their own housing, meals, and other living expenses which may apply. (GHMZBRI will reimburse the student the cost of expenses for business trip purposes). (1) Holy Master Ziguang Shang Shi will select only top students as his successive disciples amongst the graduating class. This is to ensure an excellent succession of qualified Preacher/ Buddhist Instructors in this Dharma Vanishing Era. (2) Top International graduates will be eligible to either work as one of the Guang Huan Mi Zong Buddhist Research Institute’s (GHMZBRI) faculty or preach globally if they are well-qualified and recommended. To cater to people’s needs and assist more sentient beings with good affinity, a series of short-term Buddhist Zen Meditation Programs and Health Dharma Classes will be offered to the public. (8) The application form with all aforesaid required documents should be submitted to the GHMZBRI Admissions Office via email or by mail. Admission letters will be issued for eligible candidates once the Admissions Office has fulfilled its reviewing process with all required documents.